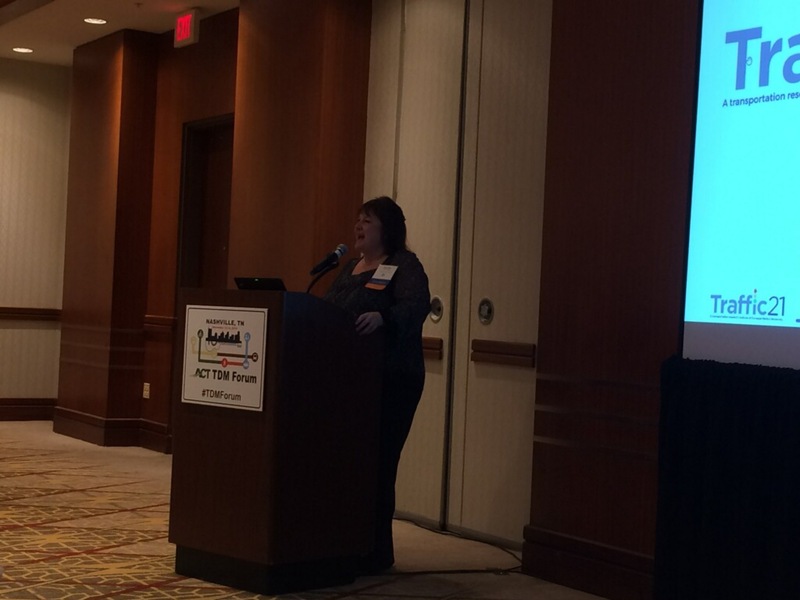 Lisa Kay Schweyer, Program Manager for the Carnegie Mellon University Traffic21 and Mobility21 University Transportation Center (UTC) spoke at the Association for Commuter Transportation’s Transportation Demand Management (TDM) Summit in Nashville, Tennessee. As part of the “Partnering with Students to Advance TDM on Campus” panel, she explained that after almost 15 years working for the regional metropolitan planning organization managing the regional commuting options organization, she moved over to Carnegie Mellon University to work on the Traffic21 Transportation Research Institute and its University Transportation Center, Mobility21. She shared that in her new role, she was surprised to learn the extent to which the federal department of transportation provided funding for academic institutions to do transportation research through the University Transportation Center program. And she cautioned the attendees who would say, “research does not relate to me” — to think again. Lisa Kay explained that research centers across the country, like Mobility21, are looking to connect with people (like those at the conference) who can provide real world feedback and perspective on what the transportation needs are. For example, the Mobility21 engagement includes the center’s Deployment Partner Consortium. This 80+ member group of community, industry and government partners is utilized for identifying real-world transportation needs, research project development and deployment, technology licensing and commercialization, student recruitment for jobs and internships, class and capstone projects. Lisa Kay is looking to continue to her efforts to promote the work of the UTCs and engage the TDM community by developing a conference workshop session for the Association of Commuter Transportation’s annual international conference to be held in the summer of 2019 in New York City, New York.